Best of the Week: AirPlay 2 coming to Sonos, BBC 4K broadcasts, KEF Rerence 1 speakers and more | What Hi-Fi? This week, Sonos announced it is looking to bring Apple's AirPlay 2 to its speakers in 2018, the BBC trialled its first live broadcast of 4K HDR content and Pioneer teased the announcement of two possible 4K Blu-ray players. For reviews, we have Apple's latest iteration of its iPad, KEF's Reference 1 speaker and Acoustic Energy's AE1 Active speakers. Last year, Sonos announced it would bring AirPlay 2 to its speakers and has now confirmed the update will be out sometime this year. The list of products affected include the Play:5, Playbase and the new Sonos One smart speaker. All future Sonos products will support AirPlay 2. Older products such as the Play:1 and Play:3 can also benefit. When grouped with AirPlay 2 compatible speakers, they will bring AirPlay to an entire Sonos system. Pioneer to fill 4K Ultra HD Blu-ray player gap left by Oppo? Could Pioneer be on the verge of announcing its own 4K Ultra HD Blu-ray player? The company has teased two possible Blu-ray players on its Japanese website. It doesn't say whether these are 4K players, but the Japanese text translated into English suggests a new chapter for its Blu-ray players. With Oppo leaving the home cinema market, this seems like a good moment for Pioneer to make its move. MORE: Pioneer to fill 4K Ultra HD Blu-ray player gap left by Oppo? The BBC successfully carried out a live broadcast of the Rugby League Challenge Cup fixture between York and Catalans Dragons in 4K HDR last weekend. The HLG variant of HDR was used to broadcast the game by Quinn Cowper, an outside broadcast engineer working on the trial. It remains to be seen whether the BBC will commit to UHD broadcasts, but with the World Cup 2018 on the horizon, we can but hope. Fire TV Cube: Amazon’s next-gen video streamer? "They’re as unfussy a high-end speaker as we’ve heard when it comes to positioning and partnering"
KEF's recent work has been outstanding, so it's with some excitement that we welcome the Reference 1 standmounts into our test rooms. Suffice to say they do not disappoint. 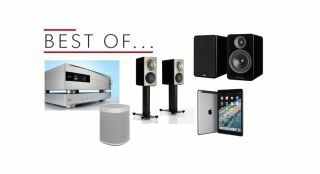 But rather than excelling in a few areas, these are superb all-rounders that work well across a range of music, systems and rooms. The Reference 1s are excellent speakers and merit our highest recommendation. "It’s comfortably the best tablet available at this sort of money"
This new iPad is much like last year's iPad, but with a few subtle differences. It now comes with Pencil support and has few notable tricks up its sleeve, including compatibility for HDR video. But that aside, it's much the same as last year's iteration. It remains an excellent tablet and is well purchasing if you don't already have the 2017 edition. Hi-fi often means your room is littered with separate components, but Acoustic Energy's AE1 Active aims to ease the clutter. They're relatively basic to set up and, once done, they perform with a flourish, offering a clear, balanced and detailed sound. It's difficult to think of a comparable amp/passive speaker combo that could better these active speakers for the price.